In this chapter we prove several absolute stability criteria that have the so-called stability multiplier form. For stationary SISO systems, these results have been known since the classical works by Zames and Falb in the 1960s. Their results were subsequently extended in 2000 to stationary MIMO systems by Safonov and Kulkarni. The method of delay-integral-quadratic constraints makes it possible to unify the proofs of theirs and some other results as well as to establish some new results involving certain classes of nonstationary systems. 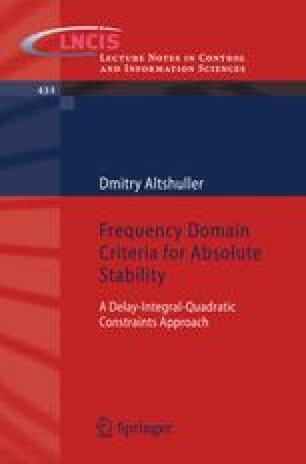 The chapter begins with the derivation, using the method of delay-integral-quadratic constraints, of a general form of stability multipliers applicable to both stationary and nonstationary systems. This requires some additional technical lemmas. Then, we use this method to prove the classical results of Zames and Falb. It is then shown that their results can be combined with the criteria of Popov and Yakubovich. Finally, we prove some stability criteria for MIMO nonlinearities, which can also be combined with one of the results of Yakubovich. We also include some discussion of the geometric interpretation and numerical implementation of the multipliers. The chapter concludes with several sections containing some more technical parts of the proofs.